The Koolatron 12-Volt Cooler System is Totally Environment-Friendly and contains no hazardous gases, nor pipes nor coils and no compressor. The only moving part is the small 12-volt fan. No messy Ice to contend with. 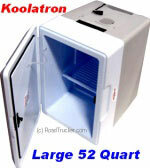 Koolatron Travel Coolers are ideal for truck, car, boat, minivans, and RVs. You can plug these compact units to a 12 volt vehicle cigarette lighter although you may need a 110 V AC adapter for home, office, or motel use. Enjoy longer road trips with a Reasonably low battery usage (Averages approximately 4.5 amps) and safe operation with No Open flames, Propane, or Toxic Refrigerants used. Koolatron's lightweight coolers provide you ease and comfort on your travel and vacation plus requiring you a very Low Maintenance (dusting and Vacuuming) only. Ideal for Truck, Car, Boat or Home or Office! Koolatron coolers maintain your food and other items cool to 22°C (40°F) below ambient temperature with a lasting performance while you're still on the road or picking up groceries. Choose a specific unit to match your needs--from 8-quart to the largest 52-quart capacity which you can all connect to any 12 volt cigarette lighter. That's how Koolatron saves you time and money! Note: Koolatron makes some Coolers in China which are only warranted for 90 days. We recommend choosing a Cooler made in North America with a 1 Year Warranty. Set it Upright Like a Mini-Fridge! Great Choice For Long Road Trips! The Michelin 12 volt Cooler/Warmer is a perfect companion for road trips, tailgating, RVing. Who needs fast food & greasy diners if you can stuff your Koolatron 12 Volt Cooler with nutritious food for long road trips? 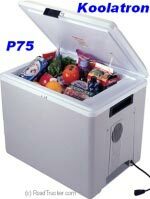 Bring Koolatron P-75 to your boat, to a picnic or tailgate parties. 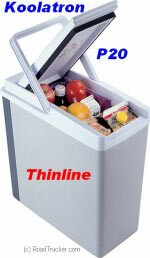 This cooler can be used horizontally or vertically like a mini refrigerator. Great 12 volt compact cooler has a convenient and flexible design that can make your travel a lot easier. Split lid/door allows you to open only half or all of the top so you don't have to unload all of the luggage in your car. Great for a couple bottles of wine and other beverages. This is money well-spent. 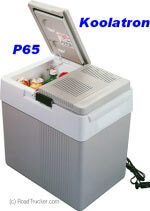 No Ice Required for 12 Volt Koolatron 29 Quart Voyager Thermoelectric Cooler. Great for Road Trips, Camping, or Even In the House. Fun Kool 12-Volt Cooler from Koolatron is a must if you like to bring snacks or soda cans with you in the minivan, RV, or even boat. The P-25 Thermo Cooler is very convenient and can also be used in the house or motel where you can stuff in extra food or beverage. Note: These 12-Volt Coolers do not Heat as the plug is permanently attached. 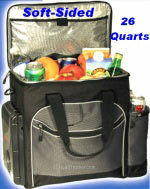 Koolatron Soft-Bag Cooler is a very nice selection if you often go out camping, RVing, or boating. Cooling to 16.5°C (30°F) below ambient temperature, this one is pretty reliable especially during vacations or out of town activities. This is really a handy travel accessory. The Koolatron's Compact Traveler cooler is a unique gift ideal for people on-the-go. Keeping lunch cool and bottled drinks chilled is just one way to use this mini cooler. Energy saving 3 amp usage and Cools to 40°F below ambient temperature. Hand or shoulder carry strap for convenience. Thinline Space Saver Compact 12 Volt Cooler is Koolatron's solution to those tight spaces between the seats of your car, van, or truck. A Bottle cooler has never been this accessible with a latch-less lid that can be opened with one hand. A total Space and Money Saver. 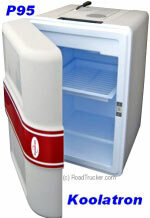 Koolatron 40B AC/DC Hybrid Heat pipe Refrigerator Operates on 12 Volt DC or 110 Volt AC which makes it a great use in a truck, RV, or boat. Considered as Koolatron's best, the 40B has a Compact, Flush-back Design and can hold up to 50.7 Quarts / 48 Liters capacity. Equipped with LED Interior light and Adjustable Temperature Control. Keep your snacks, beverages, and heat sensitive medicines cooled to 30 degrees F below ambient temperature with 12-Volt Soft Bag Traveller Cooler. 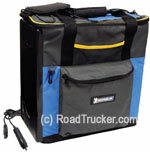 One of the smallest soft-sided coolers by Koolatron and the exterior is made of durable nylon. Ideal during lunch breaks and short travel. 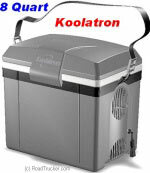 Koolatron Rechargeable 12 Volt Cooler features an advanced thermoelectric design. It powers and recharges from your vehicle's 12 Volt Outlet. 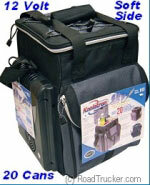 Koolatron travel cooler can hold 40 degrees below the ambient temperature.